Earlier this year, Wells Fargo took the courageous stance of acknowledging gay people exist and may want to do business with them, airing this ad featuring a two-mom family. Predictably, evangelist Franklin Graham reacted with the compassion and restraint preached by his Messiah. Just kidding, he was pissed. 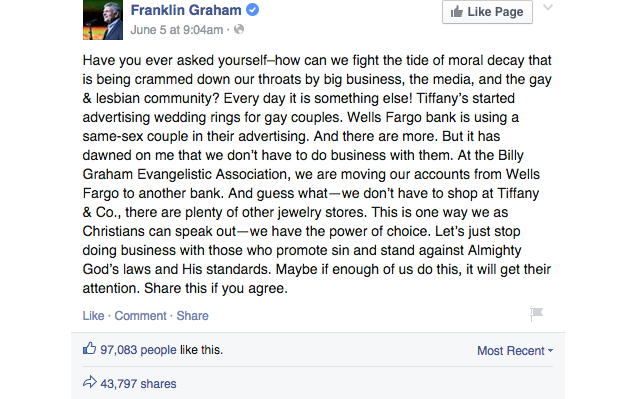 Unfortunately for Graham, the tendrils of the international homosexual conspiracy run too deep to ever truly escape: As CNN Money notes, the Billy Graham Association’s new bank, the North Carolina-based BB&T, doesn’t just depict gays in commercials but actively supports them as a sponsor of Miami Beach Gay Pride. Oh well, I’m sure there’s a homophobic mattress or something he can put his money in.